Kerley was released Saturday, Chris Brown of the Bills' official site reports. 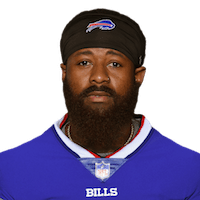 Analysis: This is a bit of a strange move for a team with such a questionable and unproven group of wide receivers, with the veteran Kerley earning the No. 3 slot job with a decent summer. The youth movement in Buffalo continues, as the team will use a now healthy Ray-Ray McCloud as its fifth wideout for Sunday's game against the Chargers. Kerley may not have that tough a time finding employment elsewhere. Kerley caught two of four targets for just seven yards in Sunday's loss to the Ravens. Analysis: Kerley, the team's No. 3 wideout who works primarily out of the slot, saw action on 69 percent of the offensive snaps, far more than No. 4 option Robert Foster (25 percent) and No. 5 option Andre Holmes (17 percent). That said, Kerley isn't much of a red-zone threat and is at best the fifth option in a stinky offense, leaving his expected production on the low side each week. Kerley caught his only target for 18 yards during Sunday's preseason loss to the Bengals. Analysis: Kerley is almost certain to make the team given the Bills don't have many other viable slot options, plus the veteran has good punt-return skills. He projects to begin the season in that No. 3 slot role, which should keep him on the field in many of the team's packages. Kelvin Benjamin and perhaps even Zay Jones look like better fantasy options for now, however. Kerley, Kelvin Benjamin and Andre Holmes took the snaps with the first team during Friday's training camp practice, Mark Gaughn of The Buffalo News reports. Analysis: Starter Zay Jones is still recovering from a knee injury, but he's expected to man an outside spot and Kerley remains the clear favorite for the No. 3 slot role. The Bills had a horrible passing offense last season and aren't expected to be an offensive juggernaut this season either, but starting roles have value in deeper leagues irrespective of team and circumstance. Kerley could potentially see solid volume if Jones continues to struggle and Benjamin sees constant double-teams. Kerley, who signed with the Bills as a free agent in April, could be a leading candidate for the No. 3 slot job, Vic Carucci of The Buffalo News reports. The Bills signed Kerley to a one-year deal Monday, Jay Skurski of The Buffalo News reports. Kerley was waived by the Jets on Monday, Ralph Vacchiano of SportsNet New York reports. The Jets moved Kerley to their roster exception list earlier this week after he completed his four-game suspension for violating the NFL's performance-enhancing drugs policy, Calvin Watkins of Newsday reports. Kerley is eligible to be reinstated from his four-game suspension, Rich Cimini of ESPN.com reports. Analysis: Kerley was handed the suspension in early November for violating the league's policy on performance-enhancing substances. There is no guarantee the Jets even bring the 29-year-old back onto the 53-man roster, but even if he is activated, the loss of quarterback Josh McCown to a broken hand would mitigate Kerley's already limited fantasy upside. The NFL suspended Kerley for four games Monday for violating the league's performance-enhancing drug policy. Analysis: Whispers of a possible suspension for the veteran wideout first surfaced ahead of the Jets' eventual Week 9 victory over the Bills, but Kerley proceed to play in that game, logging just six offensive snaps before exiting with a foot injury. The extent of Kerley's injury remains unclear, but he'll get more than a month to recover from the issue with the suspension now officially in place. Kerley is eligible to return to the active roster ahead of the Jets' Week 15 game against the Saints. Kerley needs additional testing for the foot injury he suffered during Thursday's 34-21 win over the Bills, Rich Cimini of ESPN.com reports. Coach Todd Bowles stated that Kerley suffered an ankle injury during Thursday's win over the Bills, Eric Allen of the Jets' official site reports. Analysis: Kerley was removed from the game after injuring his ankle in the first quarter. The severity of his ankle injury should be revealed after he undergoes further testing in the near future. Kerley suffered a foot injury in the first quarter of Thursday's game against the Bills and is questionable to return. Analysis: Kerley did some jogging on the sidelines before heading to the locker room with Jets trainers. As long as he remains out, expect Chad Hansen to get snaps as New York's third wide receiver behind Robby Anderson and Jermaine Kearse. Kerley, who fully participated in Tuesday's practice, expects to be available for Thursday's game against the Bills, Ethan Greenberg of the Jets' official site reports. Analysis: That said, reports of a potential suspension for the wideout are out there, so Kerley's status could change in short order in advance of Thursday's contest. With that in mind, Jets head coach Todd Bowles indicated that the team has been prepping the likes of Chad Hansen and ArDarius Stewart for added Week 9 duties should Kerley be be unavailable. Kerley, who Daniel Popper of the New York Daily News reported Tuesday would be suspended for violating NFL policy, practiced with the Jets on Tuesday, according to Rich Cimini of ESPN.com.